Shopping for frivolous and unnecessary items consumes way too much of most people’s time and budget, while chaining the new owner of this junk to a cluttered garage, a storage unit and general sedentary misery. Still there are certain tools and entertainments we wish to procure and there are many good ways to get them other than at a store. Again it is all about attitude. You must develop a resistance to shopping. It should be viewed as morally reprehensible. When you need to attain an item, do your research and find out where to get it at the best price, preferably – except, I would argue, in the case of electronics – used. Remember, the system has declared war on your family. Don’t shop much. And fight like a mercenary of the revolutionary army when you must shop. Barter is an ancient and excellent system which should be taken up across the land. Here, the palpable stench of their bloody fiat currency is absent. When we lived on that 20 acre place near Peace Valley, we always had a bumper strawberry crop. Everyone likes strawberries, so we traded our excess for pasture-raised poultry, eggs and honey. We also did a community-supported agriculture swap with a local dentist, whereby we exchanged a weekly run of in-season fresh vegetables from our garden for a good amount of dental work. Most people have been trained to be timid when it comes to asking a “professional” to barter their service for your goods/services. In doing so, you are undervaluing your own efforts. It doesn’t hurt to ask. Remember, be audacious. A good rule is, if you need to buy a more expensive item, go through your house and find something to sell to offset the purchase. You’ll be surprised how easy it is to find such an item. This spring, my wife organized a seed swap where gardeners from all over the area came to trade seeds and plants. The 35-40 people in attendance all came away with lots of free garden seeds and plants, while passing on their extras to others! We met some great new people and got to hang out with some old friends. And the matrix was shut out. On another recent occasion our good friends Phil and Amber got a bunch of trees from the Missouri Conservation Department. Phil then proceeded to dislocate his knee. Unable to plant all those trees and being the generous guy he is, he organized a tree giveaway. A handful of people showed up and each of us in turn brought various plants of our own to give way. Some of us brought food to share. Phil shared his excellent home-brewed dark brown ale. Everyone came away with something new to plant. No money was exchanged. When we lived in Missoula, MT there was an event every May which came to be known as Hippy Christmas. This was the time when all those college students left their dorms and apartments to go home for summer break or move elsewhere. The alleys, parking lots and streets near the University of Montana would gradually fill up with all manner of goodies that these youngsters had left behind. Since college has become very expensive, the kids that do attend universities nowadays are sadly from increasingly wealthy families. As a result, chances are good that their parents have bought them everything they could possibly need – and more – to fill their college abode, so what do these trustafaris care if some of these almost brand new pieces of furniture, appliances and gadgets go sitting curbside come summer break because it wouldn’t fit in their shiny new Subaru Forester? 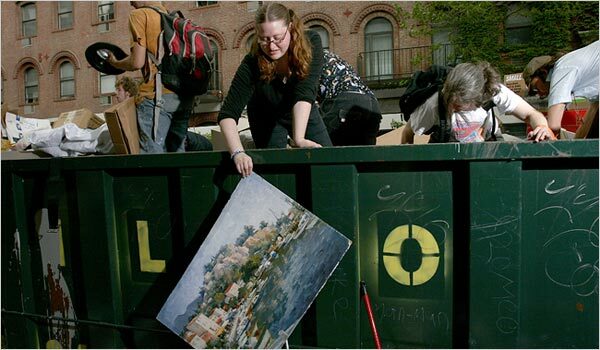 Dumpster diving is always above average in college towns because of this ongoing gentrification of our higher education system. But keep your eyes open in any town. Another good opportunity for “ground scores” occurs when people move out of an apartment. They usually can’t fit everything in their vehicle, so they tend to leave many excess items sitting beside the apartment complex dumpster. Look for the big piles. I’ve known people who made a living off of this phenomenon, scooping up these unwanted items and selling them on Craigslist or at a yard sale. We helped pioneer Missoula’s anarchist market in the mid 1990’s. Anyone could set up a table and sell whatever for free. It may have been the biggest of its kind in the country. It was too free for the white fathers on City Council and has since been corralled and added to the city balance sheet. Our friend Erin used to dumpster dive stuff and bring it to the market to sell. How’s that for audacious? Speaking of Craigslist, if you need a specific item, it is often a good place to get it at less than half the store price. It is an even better place to sell unwanted items, since there is no commission like there is on EBay. Auctions can be another great place to get things on the cheap. My wife and I had just moved into our new place here last fall and had previously been traveling ultra-light. After we sold the Alton place, we ditched nearly everything. I bought us a series of one-way tickets that took us from Chicago-Dublin-Abu Dhabi-Johannesburg-Katmandu-Bangkok-Vancouver. We fulfilled a lifelong dream of going on a safari in South Africa’s Kruger National Park and during our five-country tour of southern Africa, also got to visit the majestic Victoria Falls on the Zimbabwe/Zambia border. After another 8-month stint in Thailand, Laos and Malaysia, followed by consecutive summers in Missoula and Spearfish, we were ready to get back to the land. We arrived at our new place with literally a couple of backpacks. I had never owned less in my life and it felt great. But now we needed to furnish our new home. In October, we went to an auction nearby. I bid on five different lots of stuff. We jammed it into the car and still had to tie some things on top. We got numerous pieces of furniture, blankets, Corning Ware, baking sheets and pans, dishes and all kinds of other stuff for a grand total of $8. There are a couple of things to remember at auctions. You have to realize that the auctioneer is trying to maximize his/her commission by pushing up the prices on items. Though a friendly dance, you must realize that he is your adversary for this day. Show up early so you can survey the entire premises and see what’s for sale. If you see boxes of stuff you want you can nudge those different boxes together. If you do so, the auctioneer may very well sell those boxes as a single lot. Once you’ve lined out your bid targets, move well away from those items so as not to draw the interest of other bidders or the auctioneers. Stay extra cool and disinterested because you don’t want either other bidders or the auctioneer to think you really want those items. Otherwise, there could be a bidding war or the auctioneer could activate a straw bidder, and the price goes up. Wait until well into the bid process on that item has commenced to cast your first bid. Let at least one other person bid first. In this area we have several radio stations that do shows with names like Tradio and Swapline, where people call in to buy, sell and give away their items. This is another excellent way to sell and procure items outside the matrix store system. Bulletin boards at libraries, universities and stores are also excellent places to sell big ticket items that won’t fetch enough money at a yard sale. Make a list of items you wish to sell on a sheet of paper. Write “Must Sell!” at the top. Beside each item give a short description and your asking price. Write your phone number on the main sheet, then also write your number sideways on several little tear-offs at the bottom. Bulletin boards can also be great places to find deals on stuff you need. Again, check university bulletin boards at the end of semesters when students have burned through their cash and want to lighten their moving load. A major benefit of all of the above ways to acquire stuff is that you don’t have to pay sales tax. The only better policy than mercenary shopping is no shopping. No store represents the evils of the matrix more than Wal-Mart. As such, you should avoid shopping there. But it is an excellent place to “borrow” things. How often do you need a certain tool or whatever for one project? You buy the thing, use it once and it sets it your garage taking up space and gathering dust for the next fifty years. This is where the Chinese sweat shop, otherwise known as Wal-Mart, comes in. This particularly nefarious beast just happens to offer a 90-day return policy on most items. Make sure to keep your receipt. With it, you get cash back and won’t need an ID. Without it, you’ll get a Wal-Mart store card for the amount and a bad mark on the matrix “naughty kids” list. Get what you need, use it and return it with receipt for a cash refund. There is nothing illegal about it. It is Wal-Mart’s policy and was their idea, not yours or mine. You can abuse other Big Box stores in a similar manner.During that first meager Ozarks stint, I bought a mower at Walmart, used it for a full three months, returned it in totally hammered condition for cash; then bought one at Kmart and did the exact same thing three months later. It is very important that you NEVER do this to a Mom & Pop store. This should go without saying, but it’s amazing how many people don’t get that distinction. Mom & Pop are not the owners of the matrix. In fact, they are clobbered by it daily, just as you are. When you abuse these matrix corporate stores – who have gutted every Main Street in this country – you actually help the smaller stores by taking a bite out of Wal-Mart’s bottom line. Equally important, you are also helping to set yourself free from the matrix. The only better policy than mercenary shopping is no shopping. Chronic shopping will only take you further into the matrix prison. My wife and I go to town once a week. For us, it’s not, “Buy Nothing Day”, it’s “Buy Nothing Week”– EVERY week. It’s not just that shopping keeps you in debt, penniless and anchored to the grid via a job. Material possessions also severely limit your mobility, increase your worries (since with each new item purchased you now have more to lose), and have a generally dampening effect on your potentially revolutionary spirit. As Henry David Thoreau so eloquently put it, “Material possessions are a positive hindrance to the elevation of mankind”.